Abstract: The names may be a little kitschy, but the bags themselves are well made and fairly well thought out. 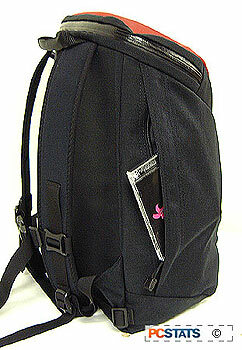 There are two schools of thought on bags intended especially for carrying around computers and like-wired accessories. Either you got it for free when you bought your notebook, or you went out and specifically found a designer bag that a.) looks decent, and b.) is bound to be another colour other than black. Let's face it, most of us are pretty cheap and tend to use whatever the store is 'giving away' at the time we bought our "precious...." (notebook that is). These default standard computer bags tend to be pleather, pretty utilitarian, and the equivalent of the 1980's brown Columbo trench coat. In other words, they get the job done but you end up looking like just another computer geek toting around a 20lb black rectangular bag make from plastic cows that don't mooo. People, there are better options out there; bags that will protect a notebook from bumps, hold more wires and cables, and frankly look a damn-sight cooler. The Tom Bihn Smart Alec and Monolith bags are just two such options. The "Smart Alec" is the knapsack, and the "Monolith" is the specially designed semi-soft shell case that snugly protects a notebook inside the cavernous bay of the former. The names may be a little kitschy, but the bags themselves are well made and fairly well thought out. And if you can step past the nomenclature that makes you feel like you're in a Toys 'R' Us buying Playschool accessories for a 4 year old, you begin to see the two separate items as a complimentary pair of layered protection for your digital investments. 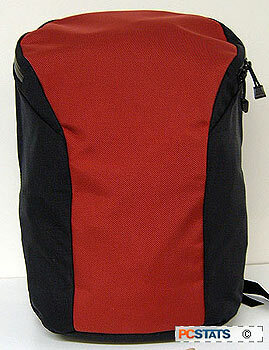 The Smart Alec comes in a Life Savers roll of colours including; Crimson, Grape, and Charcoal (red, purple, gray), and retails for exactly $100USD through the www.tombihn.com online store. Are you a Smart Alec!? A measure of the fineness of silk, rayon, or nylon yarn that relates to the thickness of the fiber. The higher the denier, the stronger the fibers. 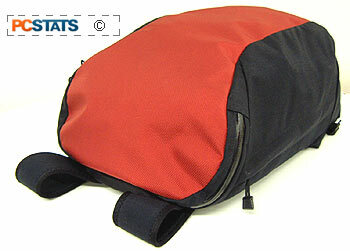 The Crimson Smart Alec knapsack we looked at measures 18.5" x 11.75" x 7.75", and has a capacity of approximately 1475 cu. in., or 24 liters. The bag itself is constructed from 1000 denier Cordura and 1050 denier Ballistic Nylon. The two smaller side compartments on either side of the Smart Alec use #9 YKK zippers, and the large bay uses a rubber coated water-resistant #10 YKK zipper that should handle the stress and strain for many years. The arm pads of the Smart Alec break from traditional thick-padded knapsacks, and are a slightly slimmer 1/4" thick. The Smart Alec tends to ride high on the back, so adjustable sternum and waste straps are also provided for a better body-fit. Tom Bihn recommend the bag for people up to about 6'2" in height, so most folks, even those in the 5'2" range, can wear it comfortably without looking silly. The inside of the main bay is lined with gray 500 denier Cordura, which does double duty by protecting the internal waster resistant urethane coating on the external layer of fabric. The bag is not waterproof in the sense you could take it diving, but it has more than a few precautions built in to ensure electronic gear stays dry during a heavy rainfall, for example. As any university student will tell you, after a while all water resistant coatings tend to wear down though. Speaking of which, carrying odd shaped and pointy objects (like physics books, or a bundle of power bars) is made much easier thanks to a layer of padding on the backside, and bottom of the Smart Alec knapsack. Pg 3. This is your Monolith. Protect It.